The single most important thing you can do to keep your tankless water heater healthy is to flush it on a regular basis. Tankless units can have a service life of 20+ years if they are properly cared for, but allow lime scale to build-up within the internal parts of the system and you'll have premature issues. Many maintenance tasks can be performed by the homeowner and flushing your tank isn't too difficult. You'll not only save money by doing it yourself, but you're also likely to perform the task more frequently since you won't need to pay a plumber. However, we still highly recommend having your gas unit inspected annually to make sure that combustion is happening as it should and everything else is okay. You may want to consider hiring a professional to flush your tankless water heater the first time. You'll have the opportunity to watch the process, ask question and take notes (maybe even record it to video!) When it's time to flush your unit again you'll know exactly what needs to be done. Consider it an investment in the health and longevity of your unit. All water based appliances have troubles with limescale build-up, even traditional water heaters, but tankless water heaters are particularly a concern. 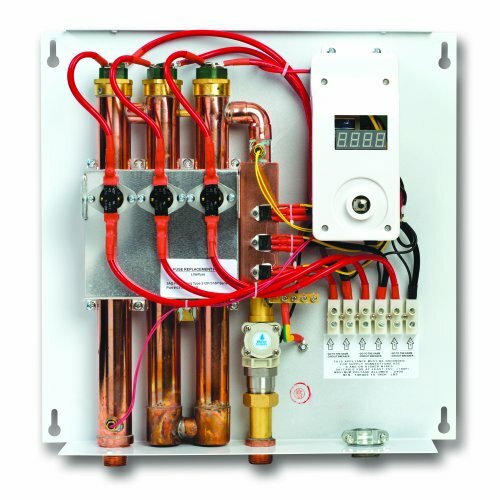 A tankless water heater is a very expensive and finely tuned system. If the unit isn't flushed, it can result in serious issues. Limescale build-up occurs when the minerals within the water separate out and begins to form a film within pipes, heat exchangers and anywhere else the water travels. When a tankless unit is flushed, the limescale is flushed from within the unit. Most manufacturers recommend flushing every 12 months, however, you should make the decision based on your location. Some areas are prone to harder water than others, which will create more limescale. The ​higher the mineral content within the water, the more lime scale will build within the unit. ​Lime scale build-up can wreak havoc on the internal parts of your tankless system and ultimately cause expensive damage. The heat exchanger is extremely sensitive to lime scale. Even a small amount of build-up will lower the unit's efficiency and increase your fuel costs. As the lime scale build-up increases the heat exchanger's burner cycles also increase to compensate for the loss of efficiency. The unit works harder than needed and the lifespan is shortened. Most manufacturer warranties do not cover damage caused by water quality. This includes lime scale build-up. The cost of flushing your tankless water heater can be as low as buying 4-gallons of vinegar. There are some supply's you'll need, but once you have them you'll be set for the future. Isolation valves with service ports are an optional item. Some manufacturers include them with their tankless system, while others leave the decision to the plumber and homeowner. These isolation valves with service ports come with a hot water pressure relief valve. The yellow handles are the cold and hot water shut-offs, and the red and blue handles open and close the hot and cold water service ports. ​* Most manufacturers recommend using vinegar, however there are some commercial solutions available. Vinegar is environmentally friendly, safe, inexpensive and effective. ** There is a flush kit available that contains hoses, a pump & a bucket. Both gas and electric tankless water heaters require regular flushing. However, they each use different procedures. Always use caution when working with your tankless system. The water within the unit can be VERY hot. Vinegar is a safe and effective cleaning agent. We strongly recommend NOT using chemicals to flush your system. Review your owner's manual for specific instructions on your unit. These flushing procedures are for GAS fueled tankless water heaters. If you have an electric system please follow the procedures outlined for electric tankless water heaters. ​The amount of time to circulate the vinegar varies between manufacturers, but as a general rule, longer is always better. Remove the access panel. Test the wires leading into the terminal with a non-contact voltage tester to verify that no electricity is reaching the unit. Close the hot and cold water shut-off valves. This will keep the cold water from entering the unit. It will also prevent water from entering the plumbing system. Open the hot water pressure relief valve on the hot water line to relieve the pressure. The water could be very hot, use caution. Hose #1 Connections: Connect one end of hose #1 to the cold water service port and connect the other end to a submersible pump. Place the submersible pump in a 5-gallon bucket. Hose #2 Connections: Connect one end of hose #2 to the hot water service port. Place the unattached end of hose #2 into the bucket. Fill the 5-gallon bucket with 4-gallons of virgin, food grade, white vinegar. Do not dilute the vinegar. Turn on the submersible pump. The vinegar should circulate thru the unit for a minimum of 60 minutes. This process will break down and flush the lime scale from the unit. The pump should run at a rate of 4-gallons per minute. If your pump circulates at a slower rate, allow the vinegar to circulate longer. Turn off the submersible pump and dispose of the vinegar. Hose #2: Remove the unattached end of hose #2 from the bucket. Place it in a drain. Hose #1: Remove hose #1 and close the cold water service port. Open the cold water shut-off valve. Do not open the hot water shut-off valve. With the cold water service valve open, fresh water will begin to run thru the unit and flush any remaining vinegar thru hose #2. Allow the water to run thru the unit for 10 minutes. Close the cold water shut-off valve. This will stop the water from flowing thru the unit. When the water stops draining. Remove hose #2 and close the hot water service port. Flush the cold water inlet filter with tap water. Replace the cold water inlet filter and open the cold water shut-off valve. Open the hot water line shut-off valve. Replace the access panel cover. Turn the electrical power On to the unit. BEST PRACTICE: Remove and clean the cold water inlet filter in between flushings. This easy task will only take a few minutes, but it can make a big difference in the health of your tankless. These flushing procedures are for ELECTRIC tankless water heaters. If you have a gas unit, follow the instructions outlined above for gas tankless water heaters. These procedures should be used as a guide. You should always check your owner's manual for specific directions on your unit. Manufacturers such as EcoSmart have designed their water heaters with the option of using isolation valves with service ports. The use of isolation valves and service ports will simplify the flushing process since there won't be a need to remove the electric heat elements. Installing these ports will require a larger upfront investment when installing the unit. If the ports are NOT installed on an EcoSmart, the tankless water heater should be flushed by following the procedures outlined below. Other manufacturers, such as Bosch, are designed with smaller water flow channels. If these units are flushed incorrectly, the narrow passages and small dip tubes will clog with lime scale during the process and require a professional to repair the unit. If your tankless water heater has isolation valves with service ports in place, you should follow the flushing steps above for gas tankless systems. You may want to consider hiring a professional to flush your unit. You can take notes, ask questions and gain the knowledge to do the job yourself next time. Turn off the electricity to the unit at the circuit breaker. Close the cold water shut-off valve to keep water from flowing into the unit. Open a faucet inside your home to drain the water from the unit. Remove the cover and use a non-contact voltage tester to verify that electricity is not entering the tankless. Remove the wires attached to the top of the heating elements by unscrewing the screws. Rotate the hexagon brass top of the heating element counter clockwise to remove the heating element from the copper tank. Look for cracks on the heating elements. If you notice any replace the element. Place the heating elements inside the cooper chambers of the unit. With the heating elements inside the chambers, fill the chambers with virgin, food grade, white vinegar. Leave the vinegar in the chambers for 90 to 120 minutes. Secure the wires to the top of the heating elements. Open the cold water shut-off valve. The tank will fill with water. Check for leaks while the tank is filling. Open several hot water taps. All the water to run thru the faucets for 5-minutes to flush the vinegar. This will also remove air pockets in the pipes. Remove the cold water inlet filter on the cold water line leading into the tank. Flush the sediment and debris from the filter. Replace the filter back on to the cold water line.